Composed by Peter Ilyich Tchaikovsky (1840-1893). Arranged by Jeff Funk. Masterworks; Performance Music Ensemble; Single Titles. 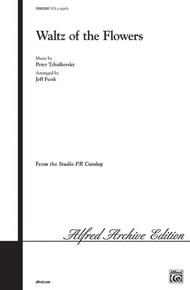 Alfred Archive Edition: Studio PR Catalog. Christmas; Masterwork Arrangement; Romantic; Secular; Winter. Choral Octavo. 12 pages. Alfred Music #00-SVM02080. Published by Alfred Music (AP.SVM02080).